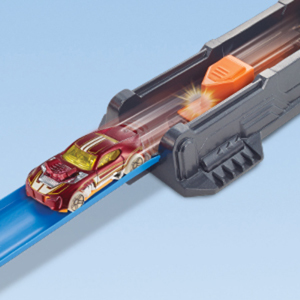 Kids send their cars around the triple loop track at top speed with three motorized boosters. 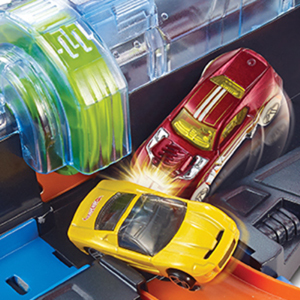 This interactive, skill-based set drives problem solving with exciting Hot Wheels action. Kids try to launch their cars without wiping out in one of the three crash zones. 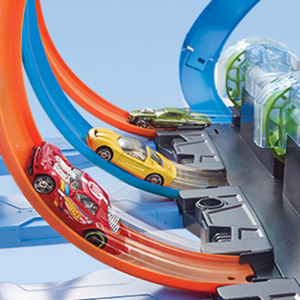 Kids can launch 3 cars and test their skill with the 3 loops, 3 high-speed boosters and 3 crash zones. Crashing is part of the fun! Send more cars into the race with the drop-in ramp. Make this set the centerpiece of a world of epic fun. Add track and other sets for more challenges. This was great for about a week. I bought for grandsons 8 b day. He and friends loved it. Then for no reason we can see the launcher died. Without that working this is just not Useable. The rubber band that launched the cars will not stay attached. So grandson hasn’t touched in two weeks. I am trying to find a replacement launcher but don’t see one online for this set. Don’t know if other “launchers” will fit or work. And don’t know how to teach Mattel. Very disappointing. Great idea, but after 3 runs through the track, the wheels that launch the car for the loops are not keeping power. It seems like the wheels bind up, and then don’t have the power to move the car fast enough. I have to turn off the motor, reset the wheels, and start over every time. Great price for this car set! You should have seen my grandson playing with it and watching his car go round and round.